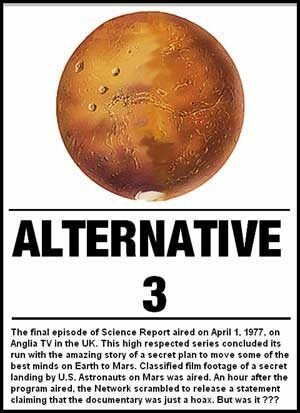 “Alternative 3″ was the final documentary done by the well respected “Science Report” of Anglia Television in England on April 1st 1977. Within an hour of broadcasting the television station issued a hurried statement stating that the show was a hoax. The TV Show “Alternative 3″ starts off as an investigation of the “Brain Drain” of England where hundreds of top scientists were leaving the country. Then it turns out that 24 of these scientists just vanished, never to be heard from again. The name “Alterntive 3″ comes from the third of three different propositions to save the human species from extinction in the event that humans are wiped off from planet earth by global warming, catastrophes etc.